I am not a gardener. I definitely do not have green fingers! The problem with my back garden is that it is very old. We have about 10 rose bushes, 2 diseased trees and a paved area in the middle where the stones are all breaking up. It also has a serious weed problem. I think the main problem is because there is a park backing onto the garden we get all sorts of seeds, pollen and plants from the park. Because it is so old (and slightly neglected) it is difficult to manage. When something is new it is much easier to look after and maintain and one also feels enthusiastic about doing so. My family don’t know much about gardening so once a year we would nominally dig up or cut the weeds and I would very inexpertly prunes the roses. However, this year we decided that we are going to refurbish our garden, Insha’Allah. So I am quite excited and looking forward to it! I have been designing, doing research, looking at different plants that we can put in the new garden. But I have basically started to pay a bit more attention to my poor current garden. My first “new” experience is actually related to the front garden rather than the back. Yes, that pest of all gardeners. Aphids. It was brought to my attention that there were rather a lot of aphids on my rose bush. 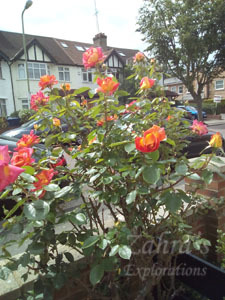 In the front garden I have two main rose bushes. One was much more badly affected than the other. The time was approaching sunset. I inspected the rose bush and it was INFESTED with aphids. EVERY SINGLE new bud was covered in them. There must have been about a million of them .There were also infestations of black things on the stem. Initially, I thought these were aphid eggs but have since discovered they are black fly. I was pretty horrified. Not sure what to do I decided to cut off all the stems covered in aphids and black fly. I had also heard about spraying them with a solution of washing up liquid. So I did as much as I could before it got dark. That evening I did some research about how to deal with aphids. (Acknowledgement: Wikihow) I read that rose bushes can get covered with a sticky substance that attracts the aphids. And in the morning when I checked the leaves did feel a bit sticky. I then proceeded to wash my rose bushes, wash off all of the remaining aphids and black fly, cut the remaining rose buds. I then sprayed them with more washing-up liquid solution. I think that the solution I made was a little bit too strong and then there is mint growing under my rose bush which was obviously also getting covered in this solution. I wasn’t very happy about this, so decided to adopt a more organic aphid repellent. Reading about the different organic solutions and looking at what I had in my cupboard I chose ginger water. 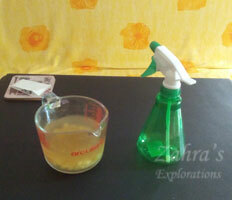 ¼ cup of chopped ginger soaked in a solution of 1 cup boiled water. 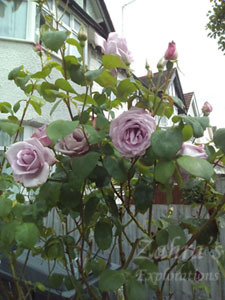 The advice (Wikihow) was to spray the roses in the morning. I did this every day for a few days and I have to say I did notice a difference, Alhamdulillah. 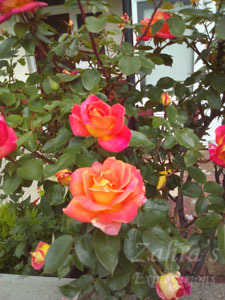 I have continued to spray my rose bushes (although sometimes not every day) and it seems to keep the aphids away. There are still some aphids and white fly. But after spraying the aphids at least go. It seems to be less affective on the black fly. There are a few clusters but, still, it is not as bad as it was before. I do reuse my chopped ginger (once) and it seems to be alright. But my mum asked me recently why do I peel the ginger why not use it unpeeled (less work) so I gave it a try. I think this made the solution much too strong. I noticed when I was spraying I started coughing, which hadn’t happened before, and the roses stated looking a bit sad so I think the solution might have “burnt” the petals. - I seriously I hate aphids. They totally give me the creeps. I still feel I bit freaked out just writing this exploration. - Also, why can’t you find any ladybirds when you need them? !